Aqvapos is the next generation of electric steam generators. We are offering innovative and individual solutions for a wide range of steam applications. All our steam generators are made entirely of stainless steel. We have solutions for any kind of demand: industrial steam, pure steam or ultra-pure steam for pharmaceutical or medical application. Aqvapos state-of-the-art steam generators are exclusively in Germany and are modular designed to promptly respond to changing demands of our customers. Aqvapos GmbH is a manufacturer of electric heated steam generators. Our team of outstanding engineers brings over 20 years of experience in development, construction and manufacturing of steam generator systems. Modular design of our state of the art steam generator systems and our custom-made approach allow us to offer a wide range of flexible solutions. The advantages of our customised designs are successfully combined with the low costs of a serial production. Our main priority is the highest quality of our products and all company processes. Therefore, we manufacture exclusively in Germany using only high-value and high-capacity components produced by renowned brand manufacturers. Our steam generators are designed, produced, and tested in accordance with the 97/23/EG pressure equipment guidelines and the AD2000 set of rules. Compared to oil or gas heated steam generators, electric heated steam generators have a number of advantages. The majority of systems powered by fossil fuels are designed as a solid centralised steam supply placed in a steam station. Steam pipeline networks consume a large amount of energy irrespective of the required steam amount. Long distances between steam generation and steam utilisation result in considerable loss of energy. In production of pure and ultra-pure steam energy loss is even greater due to the mandatory use of a heat exchanger while using oil or gas heated steam generators. Here is where the advantages of the aqvapos electric heated steam generators join the game by offering steam production where it is required and in the exact needed amount. In this way it becomes possible to considerably reduce energy costs. Energy efficiency of approx. 98% speaks for itself. High investment costs of a steam station and steam distribution facilities belong to the past. Aqvapos steam generators successfully pay off within a few years. 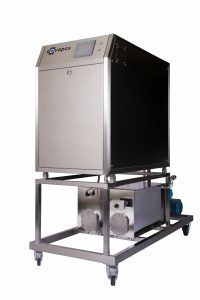 Decades of our engineers’ vast experience in development of electric heated steam generators result in production of our new aqvapos MM series – a versatile customised steam solution. Steam boilers consisting of two vapour spaces that are connected by aseptic flanges provide larger evaporation surfaces which ensures extra dry steam generation. All wetted parts are made of 1.4571 stainless steel. Due to the thought-out design it is possible to ensure an extremely high efficiency of 98%. A heat exchanger is not required even in production of ultra-pure steam, which is a significant advantage over oil or gas-operated systems. Steam is produced within a few minutes due to the use of a powerful electric heating system. The state-of-the-art PLC control allows precise control accuracy of +-0,2 bar in standard design and +-0,02 bar in “High Precision” mode. Simple, intuitive operation with a Siemens-Touch control panel and multilingual support. Due to the modular design of our products is it possible to combine any number of steam generators and add-on modules, which makes it possible to extend steam-producing capacity at any time to suit any need. Modern semi-conductor technology ensures high-precision control and smooth operation of the heating elements, which significantly increases the product lifetime. Design and construction of the aqvapos quick steam generators allow an easy access to all system components for ease of maintenance. The processor controlled safety temperature regulator with 1002D (SIL 3) architecture ensures the overall safety of the operating staff. Production takes place exclusively in Germany. The usage of high quality materials and components ensures a long product lifetime and low maintenance costs. Due to the low investment and operating costs, aqvapos steam generators pay off within a few years of operation. Modular design of our systems allows a high degree of prefabrication. Thus, we are able to provide a very quick delivery offering the variety of customised solutions at the same time. Do you need help with planning and implementation of you customised steam application? We offer you personal, custom-made and suitable consultation instead of selling standard solutions.